‘Shopping by the Sea’ is a great way to describe Blackpool Town Centre. Here, you can mix a trip to the seaside with a visit to the high street! Blackpool town centre covers more or less the inland area behind the promenade, between North Pier and Coral Island. The land at the rear of the Golden Mile and Blackpool Tower. 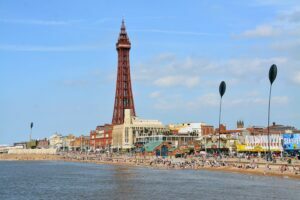 The promenade along Blackpool seafront is lined with the attractions that we all love, along with gift and souvenir shops. You’ll find all this more or less from North Pier to the junction at the Manchester Hotel. 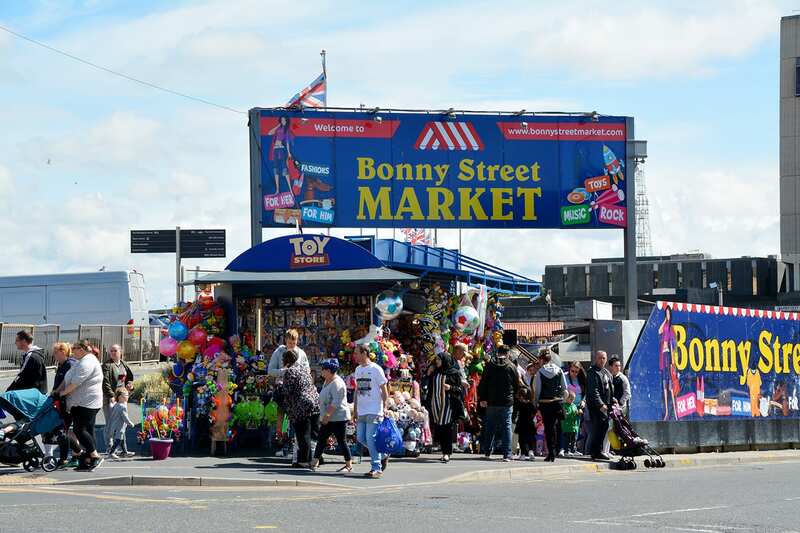 Bonny Street Market (below) is at the rear of the SEA LIFE centre. 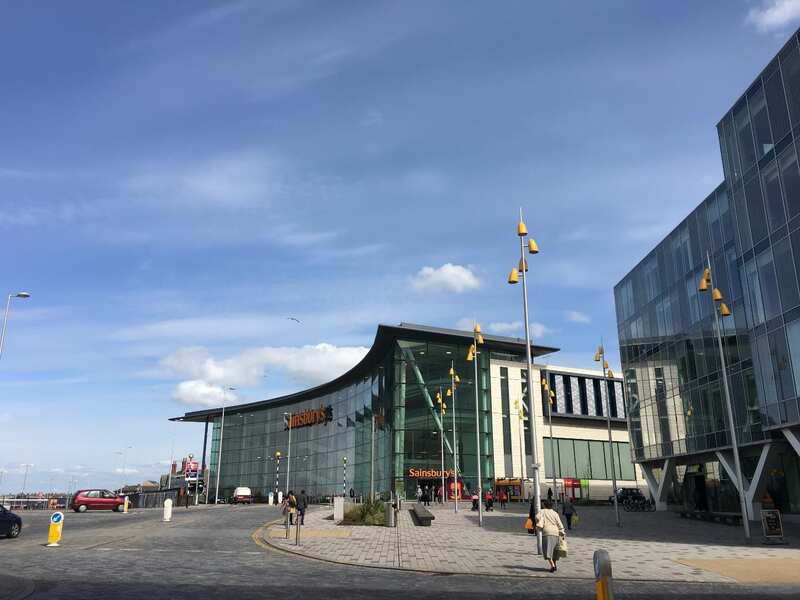 After a run of seafront hotels and places to stay, there are more shops and attractions at South Shore. 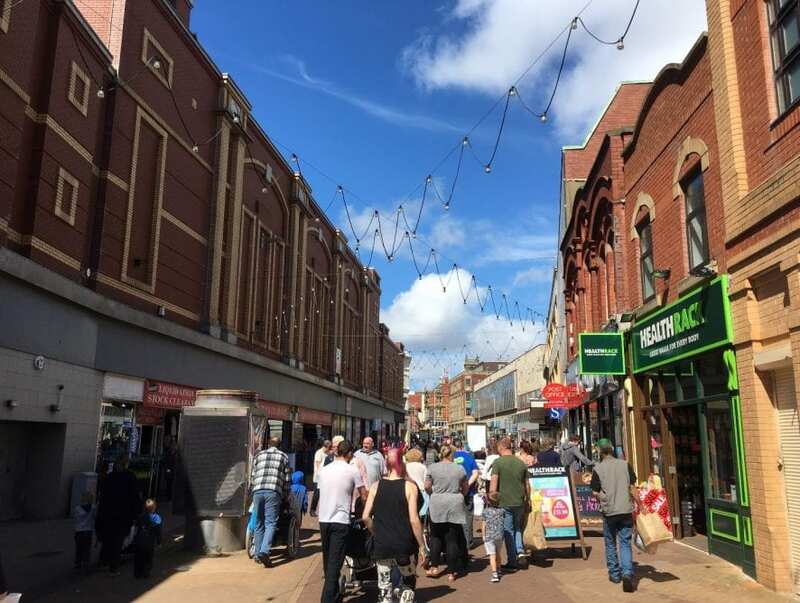 Most of the main shopping streets in Blackpool town centre are pedestrianised. A lot of the highways are one-way, so traffic is far from heavy in the main shopping area. Bank Hey Street (below) is the pedestrianised road which runs parallel to the promenade, behind Blackpool Tower and the next block of buildings where you’ll find Viva. 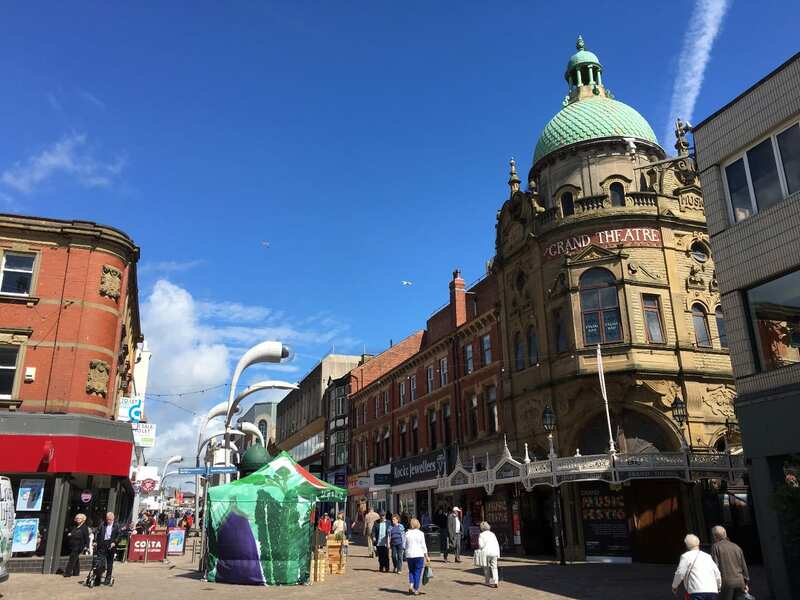 Blackpool Town Centre. Viva Blackpool is on your left. St John’s Square is the pedestrianised area outside the Winter Gardens. It’s a central spot between Abingdon Street and Church Street. Here, there are pavement cafes, restaurants and an open performance space, where you’ll often find events and entertainment. Church Street is also pedestrianised. 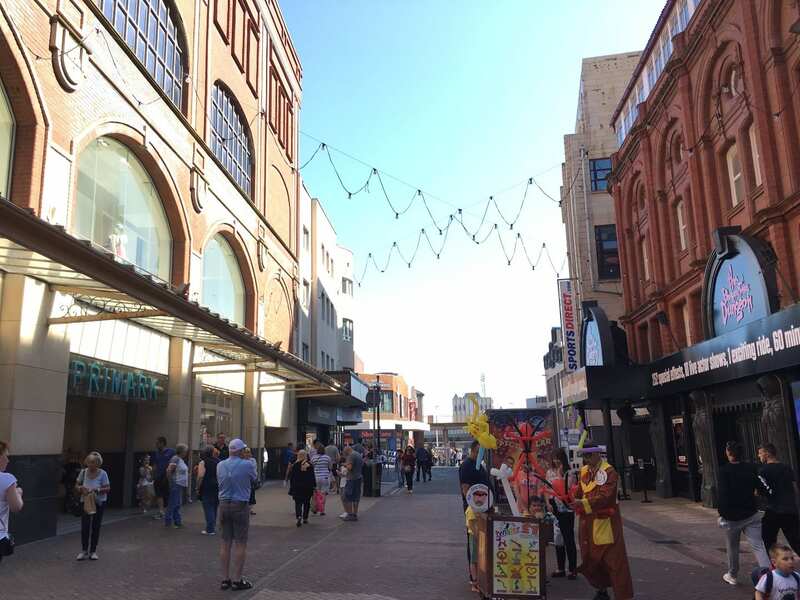 That’s the one that runs at right angles to the sea, past the front of the Winter Gardens, Marks and Spencer, the Grand Theatre and Viva to join the promenade near Festival House. 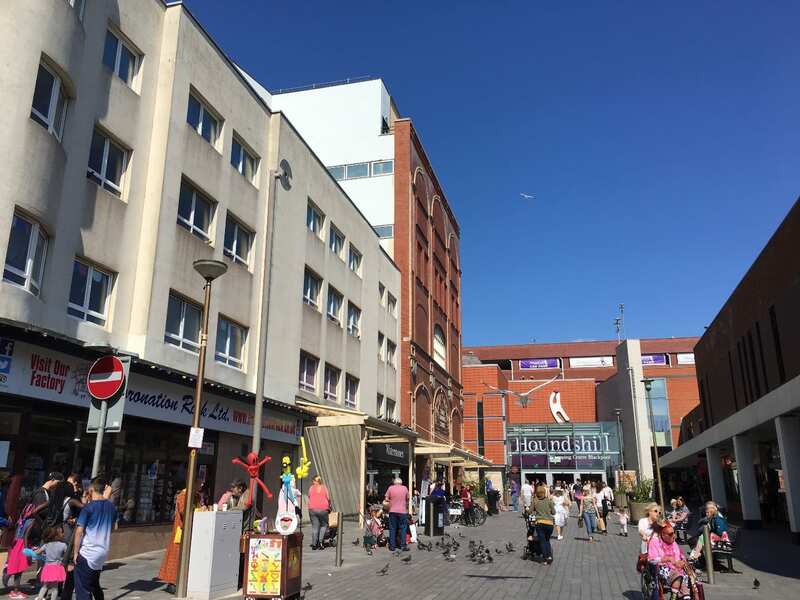 Inland, the town centre area includes Blackpool North railway station. A major building project is underway to build an extension to the tramway at Talbot Road. It will connect the seafront tram lines with the train network. This is also the area where you’ll find the large Sainsbury’s (below) and Blackpool Council offices at Bickerstaffe Square. It’s part of the Talbot Road Gateway project. 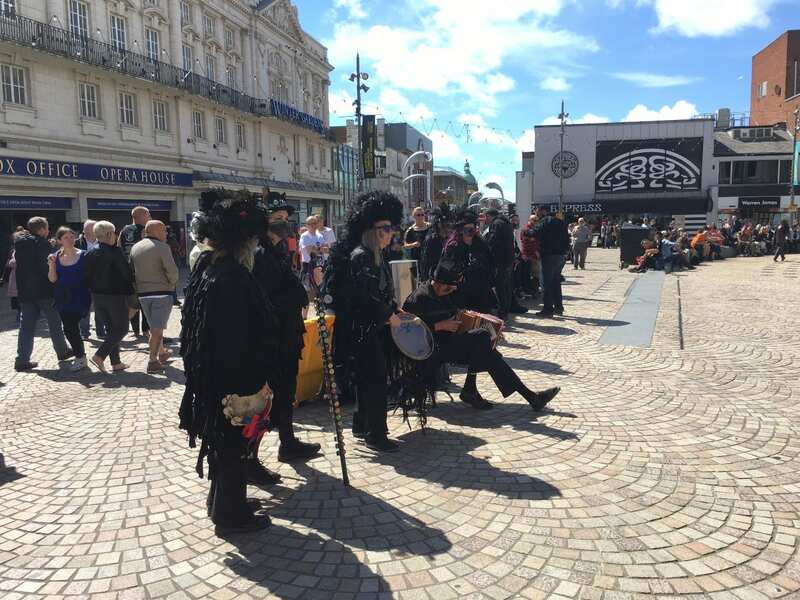 Blackpool Town Centre is managed by Blackpool BID. 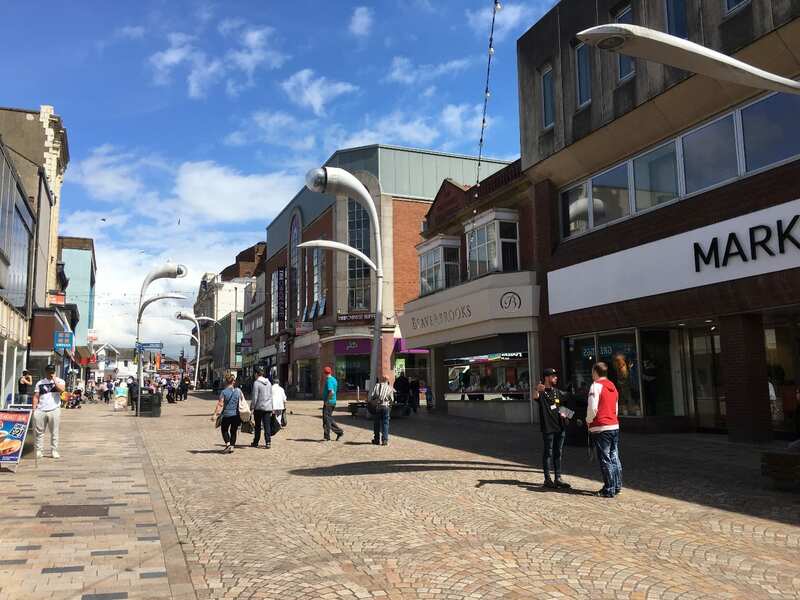 The businesses in the BID area pay a levy which is used for a variety of things, to make the town centre cleaner, safer and more attractive for people who work there, shop and visit. Although it’s a traditional outdoor town centre, Blackpool is actually quite kind to shoppers who are out in poor weather. 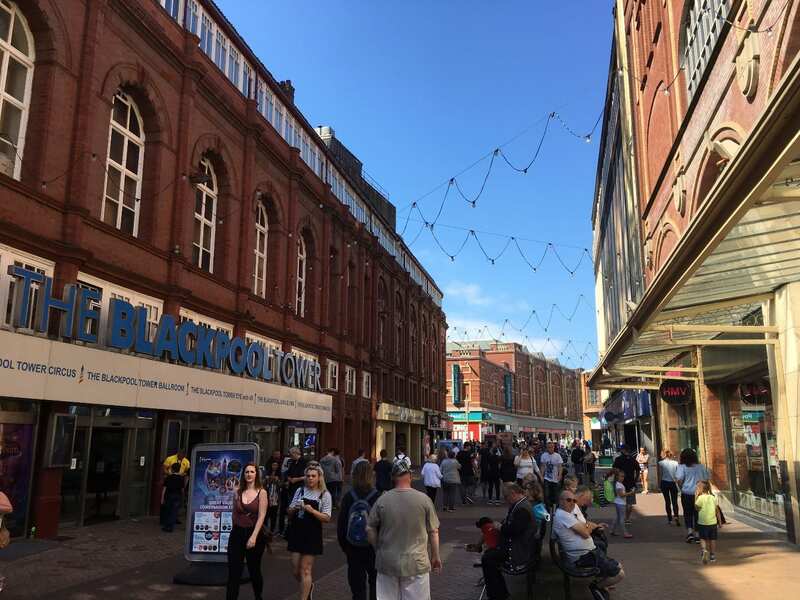 Although it covers quite a large area, the shops in Blackpool are actually quite close together. You don’t waste loads of time and energy walking from shop to shop – and when it’s raining you can dodge most of the raindrops! Not forgetting that the Houndshill Shopping Centre is all undercover so you won’t get wet in the rain – or burnt if it’s boiling! Inside the Houndshill are national names including Superdrug, Next, New Look, Clarks and Primark, along with take away and cafe food outlets. It’s on the left of the photo below and under the watchful eye of Blackpool Tower. There you’ll find around 70 retailers, and a multi-storey car park. Did you know? The Houndshill Centre first opened in August 1980. An extension was added and it was fully refurbished before re-opening in its current form in September 2008. 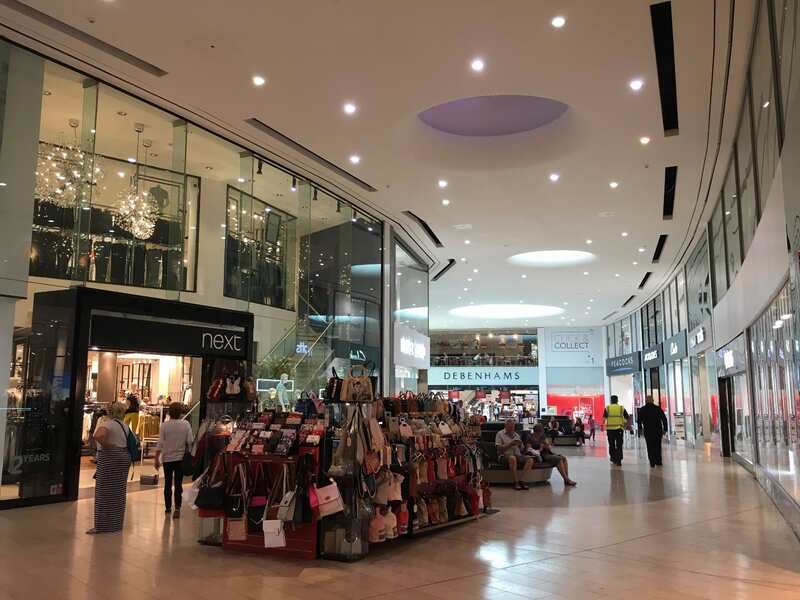 You can browse in comfort inside the Houndshill Centre where you’ll find Debenhams, Primark and other major chains. Houndshill Shopping Centre, Blackpool town centre. Not many yards behind where this photo was taken is the sea! Primark (on the right in the photo below) opens out onto Bank Hey Street. 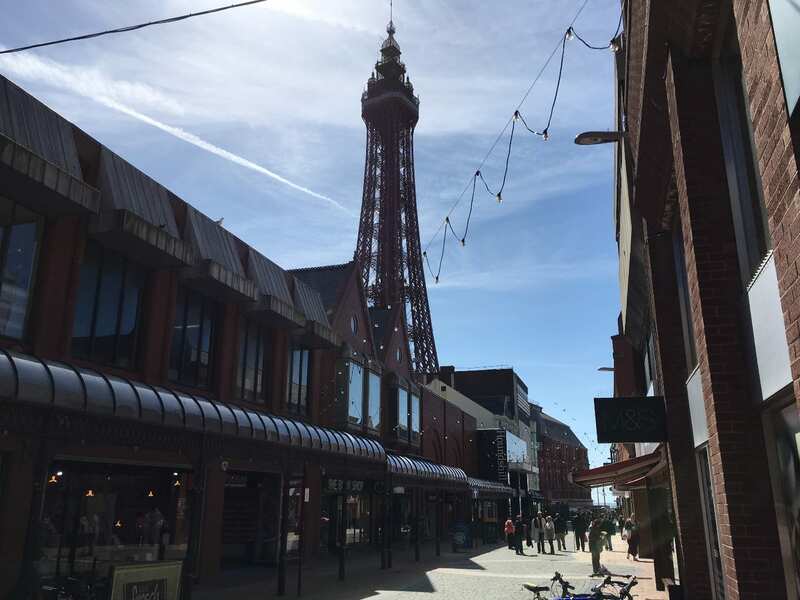 That’s the pedestrianised area to the rear of Blackpool Tower which we explored at the start of this page! The national names are well represented in Blackpool with Marks and Spencer, WH Smith, Boots and plenty more having stores in town. Further up Church Street, around Abingdon Street Market and St John’s Square are the smaller, independent stores. They sell all kinds of things from jewellery to designer clothes, homewares and accessories.  Plus of course there are hairdressers, nail bars and other similar businesses there too. 2011 saw the return of the first town centre supermarket when the Co-op opened on the corner of Birley and Abingdon Street. It was followed by the new flagship Sainsbury’s supermarket which is part of the Talbot Road development. Have you seen Brilliance on Birley Street? 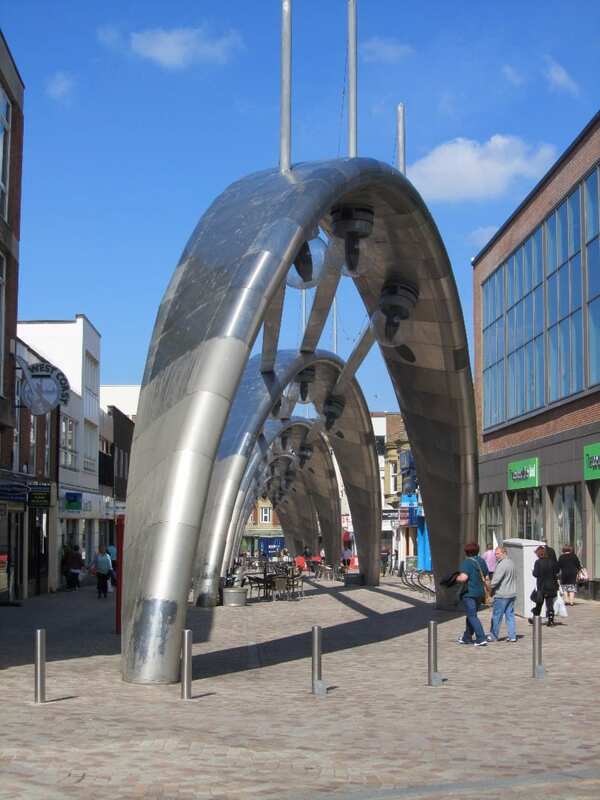 In daylight, the huge arches create a sculpture along the skyline and play music to create a pleasant atmosphere for people eating at the pavement cafes. It’s designed to come to life at night in a show of light and music. Birley Street is also pedestrianised, which makes a great atmosphere for the pavement cafes and bars and an ideal spot from which to sit and watch the world go by. There are a number of handy town centre car parks in Blackpool. There are a number of multi-storeys including the Houndshill Centre, plus surface car parks which include the huge Central Car Park. Don’t forget of course that you can travel along the seafront on a Blackpool tram – a new purple one or an old Heritage one. Along with the bus service there are plenty of easy ways to get around town with Blackpool Transport Services. 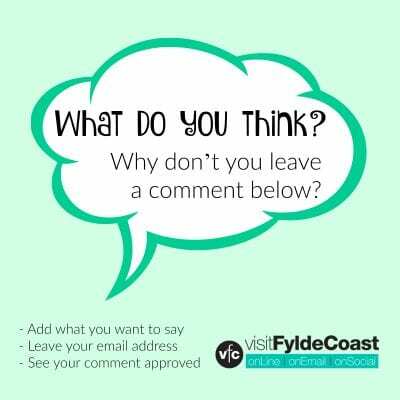 Whether you’re a Fylde Coast resident, here on holiday or visiting for the day – we hope that you enjoy visiting Blackpool town centre. 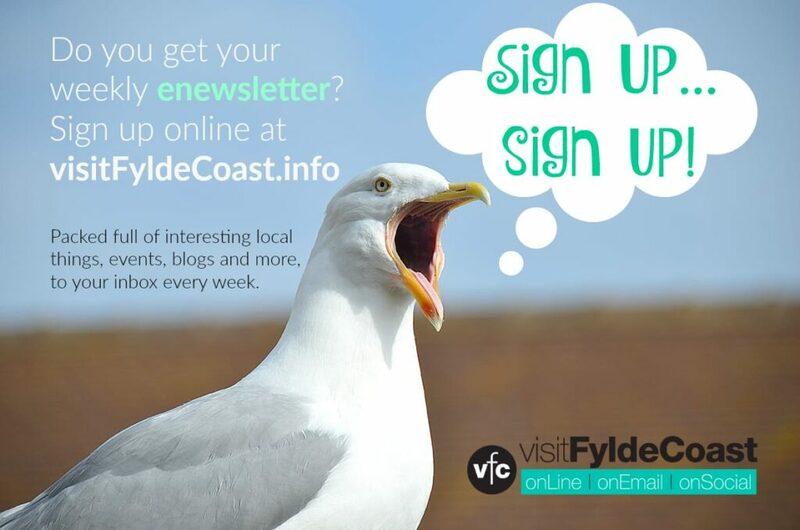 You’ll be entertained, enjoy something to eat, have a spot of shopping and a walk along our fabulous seafront. What more could you want. 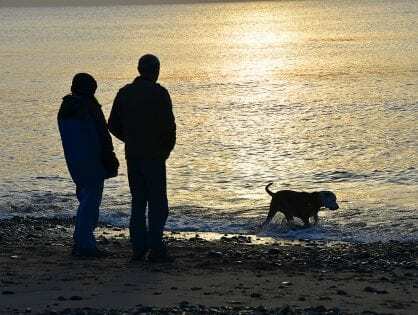 Fill your lungs with sea air and enjoy the seaside!